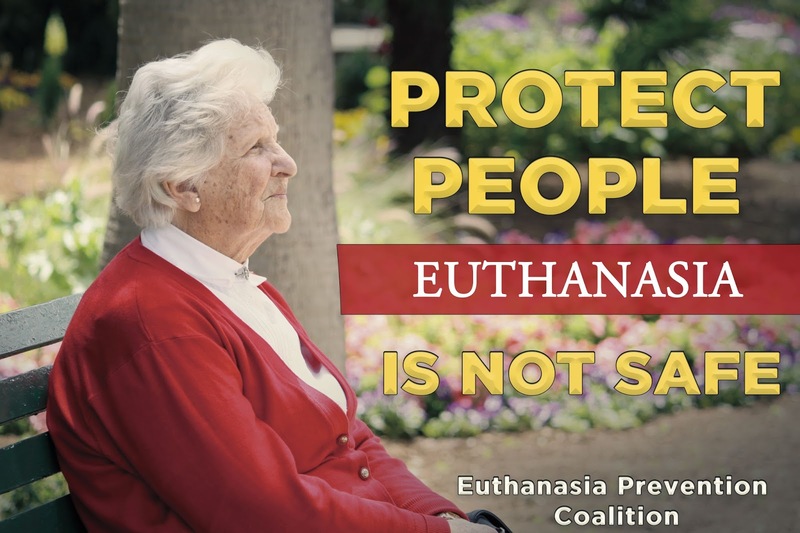 Euthanasia Prevention Coalition Euthanasia Prevention Coalition: Study uncovers problems with euthanasia for psychiatric reasons in the Netherlands. Study uncovers problems with euthanasia for psychiatric reasons in the Netherlands. 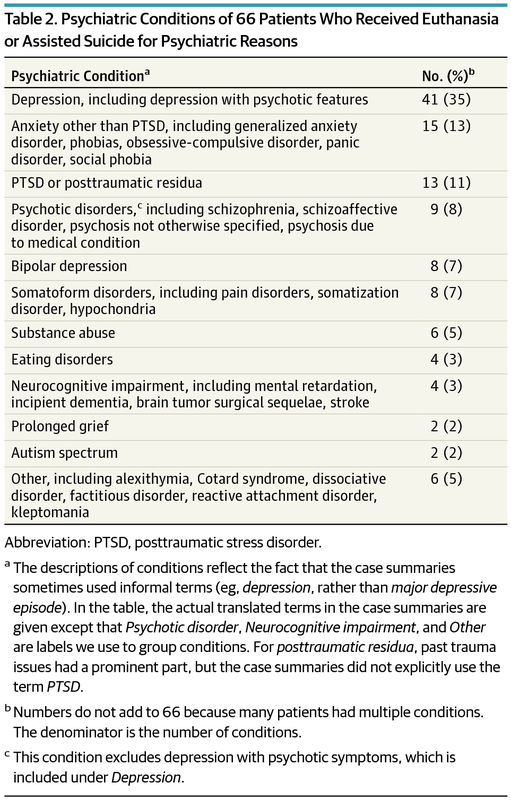 The journal JAMA Psychiatry recently published a study on February 10, 2016 examining euthanasia for psychiatric reasons in the Netherlands by researchers Scott Y. H. Kim, MD, PhD; Raymond G. De Vries, PhD; John R. Peteet, MD. The study examined 66 cases of euthanasia for psychiatric reasons between 2011 and 2014. The data for this study was provided by the Netherlands Regional Review Committee. It should be noted that the euthanasia reports are submitted by the doctor who causes the death, after the person dies by lethal injection. Therefore the data, as bad as it may appear, may not uncover all of the problems since doctors are self-reporting the euthanasia deaths, a system that enables physicians to hide information that may be controversial. The Netherlands 2014 euthanasia report stated that there were 41 euthanasia deaths for psychiatric reasons and 81 people with dementia died by euthanasia. However, in one EAS case, a woman in her 70s without health problems had decided, with her husband, that they would not live without each other. After her husband died, she lived a life described as a "living hell" that was "meaningless." The review found that 21 patients had been refused EAS at some point, but in three cases the physicians later changed their mind and performed EAS. The remaining 18 patients had physicians who were new to them perform EAS. In 41 per cent of the cases the physician performing EAS was a psychiatrist, but in the rest of the cases it was usually a general practitioner, the review found. Consultation with other doctors were "extensive, but in 11 per cent of the cases, there was no independent psychiatric input. In 24 per cent of the cases, there were disagreements among the physicians. while the assessment of most terminal illnesses does not involve a lot of "physician discretion," and doctors can be "fairly sure" what the eventual outcome for the patient will be, psychiatric conditions are less clear. 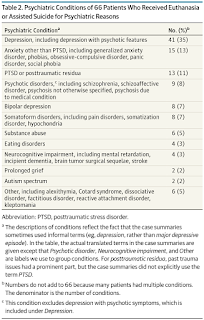 "Physicians must make tricky clinical determinations … without the help of a robust evidence base,"
"There is no evidence base to operationalize 'unbearable suffering,' there are no prospective studies of decision-making capacity in persons seeking EAS for psychiatric reasons, and the prognosis of patients labeled as 'treatment-resistant depression' varies considerably, depending on the population and the kind of treatments they receive." Canada is currently debating euthanasia for psychiatric reasons. 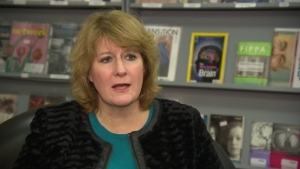 Tara Brousseau-Snider, executive direct of the Mood Disorders Association of Manitoba, said she is concerned about the potential of Canada offering doctor-assisted suicide to those with mental illness. According to CTV news, she said a woman with severe depression came into the Winnipeg centre just months ago and told a counsellor that she wanted to end her life. "I find this is very alarming, very worrisome because people, through different avenues, find a different way of life and nobody needs to sit with depression and be miserable all through their lives. There are options; there are supports available," said Brousseau-Snider. The Canadian government should heed the results of this study and ensure that if euthanasia becomes legal, that it is not permitted for psychiatric reasons.